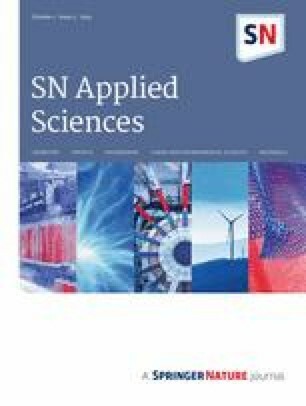 In this work, the performance study of an automobile radiator using nanofluid in comparison with distilled water as coolant in the heat exchanger-based radiator is evaluated. The distilled water and nanofluid are flown through the radiator consisting of upright tubes with an elliptical-shaped cross section. Forced air is passed through the radiator perpendicular to the direction of fluid flow in tubes. The experiments are performed with three different volumetric concentrations of nanofluid (Al2O3–water), with different flow rates, air flow velocities, and fluid inlet temperatures. The results obtained from this study demonstrate that an increase in fluid flow rate and air flow rate improves the heat transfer performance. It was found that an enhancement in heat transfer rate was found to be the maximum up to 44.29% at 0.2% volume fraction of alumina-distilled water-based nanofluid in comparison with distilled water. The effectiveness of radiator was found maximum up to 40.3% at 0.2% volume fraction of alumina-distilled water based nanofluid at 40 LPH. An essential requirement for an automobile cooling system is miniaturization of the thermal system in addition to its ultra-high performance. The vital role in the development of energy efficient fluids is played by “thermal conductivity” of the heat transfer fluids. Previously used coolants such as water, ethylene glycol (EG), and oil put many restrictions in the growth of developing an efficient thermal system mainly because of their poor thermal conductivity. Nanotechnology helped in obtaining nanosized particles which lies in the range from 1 to 100 nm and to form nanofluids when mixed with some base fluids like water, EG etc., to find the solution for thermal systems. Most of the thermal properties in nanofluids like thermal conductivity are superior to the base fluids which have certainly helped them in gaining a lot of attraction. A lot of research work has been completed by different authors on the different metal oxide-based nanofluids and their effect on various properties in comparison with the base fluids. There have been various studies [1, 2, 3, 4, 5] focussing on improvement of the thermal conductivity of the nanofluids as compared to the base fluids in the field of automobile radiators. 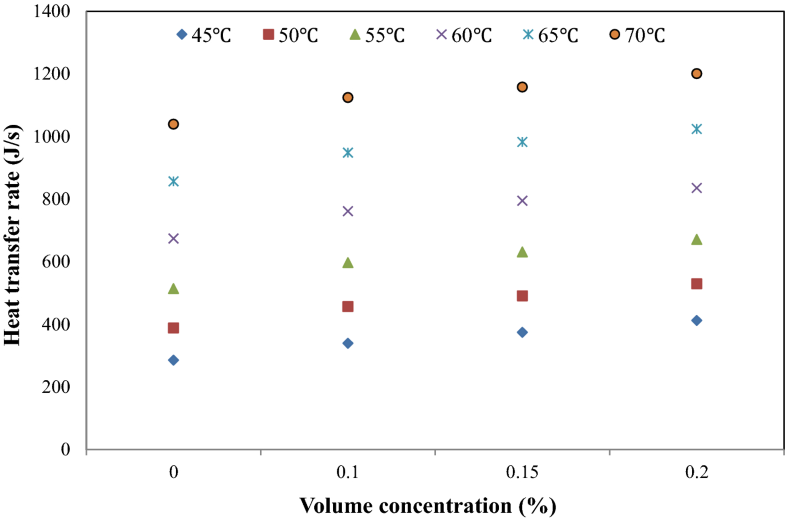 Ali and Yunus  evaluated thermal conductivity and thermal diffusivity experimentally and also the influence of parameters such as volume fraction and material of the given nanosized particle on them. They found that an improvement in thermal properties was shown by the use of metallic nanofluids as compared to nonmetallic nanofluids. Murshed et al. in their research studied the effect of volume concentration and shape of the TiO2 particle on the thermal conductivity of titanium-based nanofluids by using de-ionized water as the base fluid. Their study concluded that the particle shape and sizes have greater impact on the thermal conductivity. According to Eastman et al. , copper-based nanofluid with EG as base fluid provides higher thermal conductivity as compared to pure EG or other oxides/EG nanofluids. It was concluded that metallic-based nanofluids possess higher thermal conductivity enhancement as compared to nonmetallic nanofluids. Nassan et al. observed the effect of two different nanofluids such as alumina-based and copper-based nanofluids with water as base fluid on heat transfer characteristics. They concluded that a considerable increase in the rate of the heat transfer was found for both of the nanofluids. Heris et al. considered constant wall temperature boundary condition and examined the heat transfer characteristics of a rounded tube while using Al2O3/water nanofluids as heat transfer fluid. The variation of Nusselt number with Reynolds number and Peclet number was investigated. From the results, it was clear that the coefficient of heat transfer increases with volume fraction of the particle volume concentration and Peclet number. Wen and Ding  experimented on circular tube made of copper material for the evaluation of convective heat transfer coefficient. They prepared nanofluids by using γ-Al2O3 nanoparticles and de-ionized water. The laminar flow region was considered for the purpose of experimental work. They observed that the heat transfer enhancement was significant in the entrance region of the tube which was mainly due to the addition of nanoparticles in the base fluid which is the result from an increased thermal conductivity. Huminic and Huminic  examined the flat tubes of an automobile radiator for evaluation of cooling performance. They concluded that the coefficient of heat transfer of the given nanofluid is directly proportional to the Reynolds number and volume fraction of the particle. Another conclusion was drawn from the experimentation that the heat transfer coefficient of the given nanofluid was much higher than the base fluid. 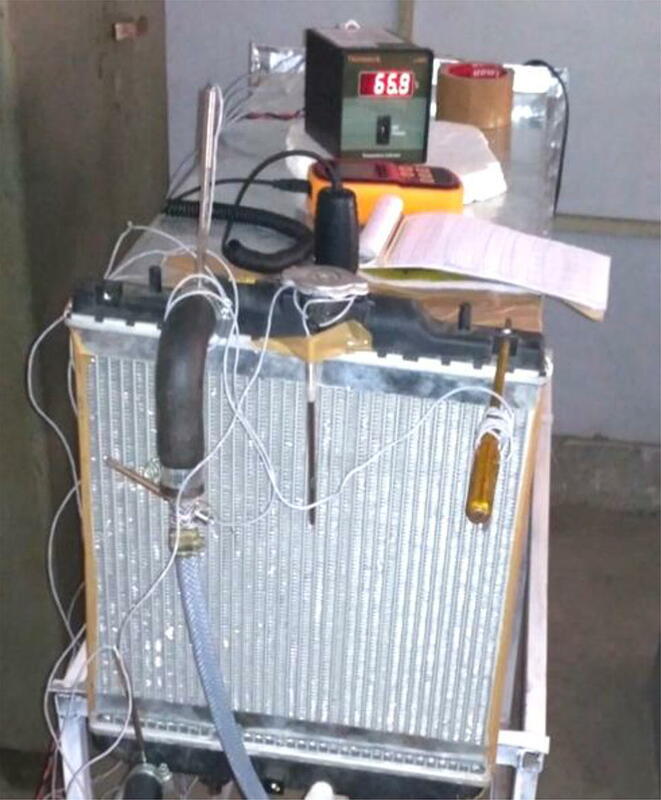 Chougule and Sahu  conducted experiments on automobile radiator by using carbon nanotubes and alumina based nanofluids with water as base fluid as a coolant. They found that as the nanoparticle concentration is increased, thermal conductivity also increases, and consequently, the cooling performance of the radiator increased. Ali and Arshad  used water based nanoplatelet nanofluids to work on the angle effect of pin fin heat sink channel in terms of coefficient of convective heat transfer, log mean temperature difference (LMTD) and thermal resistance. Arshad and Ali  performed experiments by using aqua based GNPs and compared both hydrodynamic and thermal performance with the distilled water on a fin heat sink. From the results, it was found that by using aqua based nanofluids, the convective heat transfer was enhanced for a given Reynolds’s number. Arshad and Ali [16, 17] studied the effect of aqua-based TiO2 nanofluid on a minichannel heat sink, the pressure drop and its heat transfer characteristics. It was found that with decrease in the heating power, the pressure drop was found to increase and this trend was much favorable in TiO2 nanofluid in comparison with distilled water. Jajja et al. compared multiwalled carbon nanotube (MWCNT) nanofluid with de-ionized water on a minichannel heat sink for different fin spacing and in order to evaluate their performances. They observed that coefficient of overall heat transfer gets increased by the involvement of reduced size fin spacing with MWCNT as a nanofluid. Khan et al. in their research work used a solar dish aided by supercritical CO2 re-compression with Brayton cycle and compared its exergy and energy performances. They observed that oil-based alumina nanofluid has the highest value of the energy and exergy efficiencies. Siddiqui et al. worked on the rate of cooling for a flat heat sink in order to cool a microprocessor heat generator using Al2O3- Cu based nanofluid with de-ionized water as the base fluid, and later this rate of cooling was compared with cooling rate of water. Tariq et al. 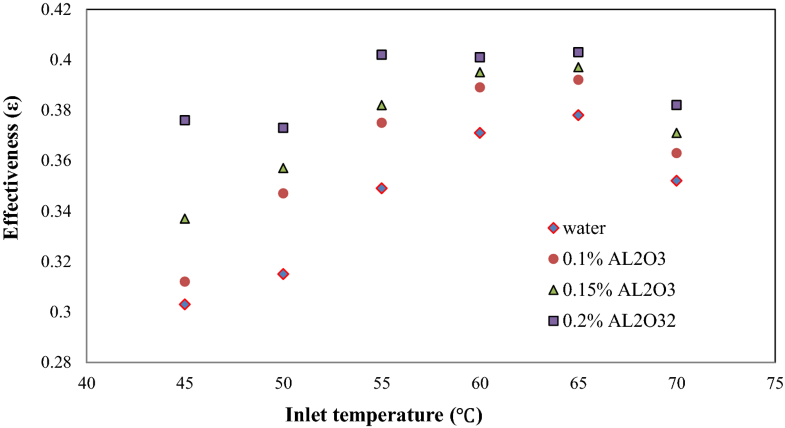 validated their experimental results with the numerical results obtained from computation fluid dynamics based on study of thermal performance of micro-hole cellular structure using water as a cooling fluid. Ali et al. experimentally calculated the effect of zinc oxide aqua based nanofluid as a coolant in an automobile radiator with different volume concentrations. 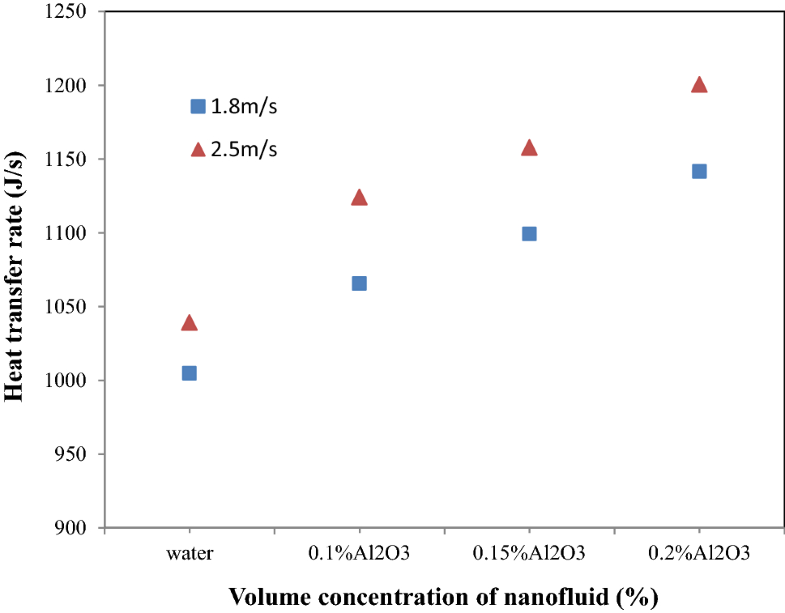 The nanofluids showed enhancement in the heat transfer after the use of aqua based nanofluid. Ali et al. applied the use of water based magnesium oxide nanofluid to the automobile radiator. The heat transfer performance of the automobile radiator was tested with different volume fractions. It was observed at each concentration, there was a rise in the rate of heat transfer as compared to the base fluid. Sajid and Ali  in his work focused on the nanofluids and their applications. It also focused on various thermal parameters such as thermal conductivity, thermal resistance, friction factor, Nusselt number, heat transfer coefficient, and pressure drop and the effect of nanoparticle concentration, size, shape, and nanofluid flow rate on them. Pak et al. investigated the turbulane and heat transfer behaviour of dispersed fluids in circular pipe. They found that Nusselt number of the dispersed fluids for fully developed turbulent flow increased with increase in volume oncentration as well as Reynold’s number. Sajid and Ali  in their study made a comprehensive review with the help of experimental, numerical and ANNs on thermal conductivity of the hybrid nanofluids. Heris et al. experimentally calculated the effect of nanoparticle-based coolant on the heat transfer performance of a car radiator. Nanofluids were prepared by using CuO nanoparticles of 60 nm. EG and distilled water mixture are used as the base fluid. The results showed that heat transfer rate increased considerably as compared to base fluid. Bozorgan et al. calculated the fluid flow and heat transfer characteristics of an automobile diesel engine radiator using CuO-water nanofluid. The study of effect of vehicle speed and mass flow rate of the nanofluid on the thermal performance of radiator was studied showed that the coefficient of overall heat transfer of the given nanofluid was higher than that of water; thus reducing the total heat transfer area of the radiator. However, the significant increase in required pumping power may enforce some restrictions on the proficient utilization of CuO-water nanofluids in automotive diesel engine radiators. Ali et al. , with five different concentrations, studied the effect of alumina-based nanofluid with water as base fluid on the cooling system of an automobile to check its thermal performance. Gradual improvement in heat transfer was observed with a particle volume fraction of 0.1, 0.5 and 1.0% and was optimum at 1.0%, while it declined with further increment in particle volume concentration. In this work, the performance study of an automobile radiator using nanofluid in comparison with distilled water as coolant in the heat exchanger-based radiator is evaluated. The distilled water and nanofluid are flown through the radiator consisting of upright tubes with an elliptical-shaped cross section. Forced air is passed through the radiator perpendicular to the direction of fluid flow in tubes. The experimental test-rig developed in this study is used to evaluate the heat transfer phenomenon of Al2O3–water-based nanofluid with different percentages of nanoparticles. The major components are automobile radiator, metallic duct with exhaust fan, fluids storage chamber with heating elements and water circulating pump. To record the observations and to control heating, various instruments are used, viz., rotameter, digital anemometer, multi-function AC power meter, temperature sensor and temperature controller. The required flow rate and temperature at the inlet were regulated by gate valve and thermostat, respectively. The experiments were carried out at different inlet temperatures (45–70 °C) of hot fluid. 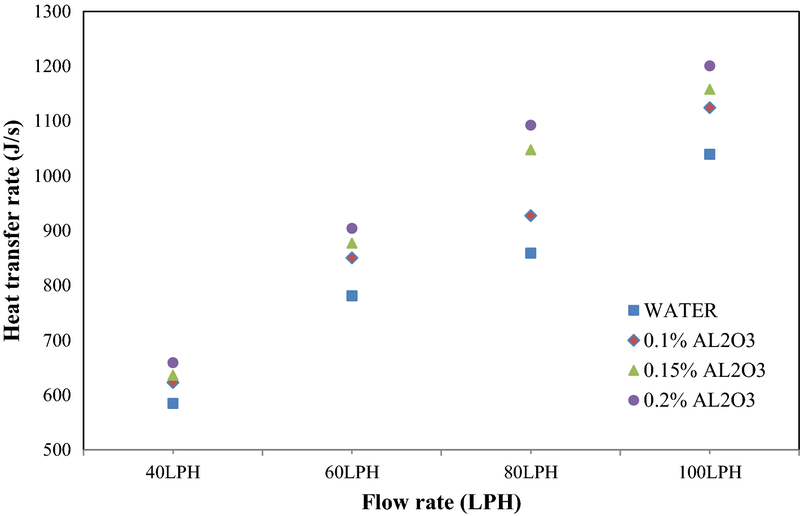 Different flow rates in the range of 40–100 LPH were used in the study. The velocity of the cold circulating air over heat exchanger was varied in the range of 1.8–2.5 m/s using speed regulator and measured with anemometer. Six thermocouples were located at different positions of the radiator to measure the temperature of hot and cold fluid streams. The experimental test rig used in this study is shown in Fig. 1. Initially, experiments were carried out using distilled water as working fluid in order to evaluate the enhancement in the thermal performance of heat exchanger which was followed by alumina-distilled water-based nanofluids worked with different volume fractions of 0.1%, 0.15% and 0.2%, respectively. The estimation of the amount of nanoparticle required for the concentration is given in Eq. (1). The average size of the alumina nanopowder was 50–250 nm. It was purchased from Nano Wings Pvt. Ltd, Telangana, India. 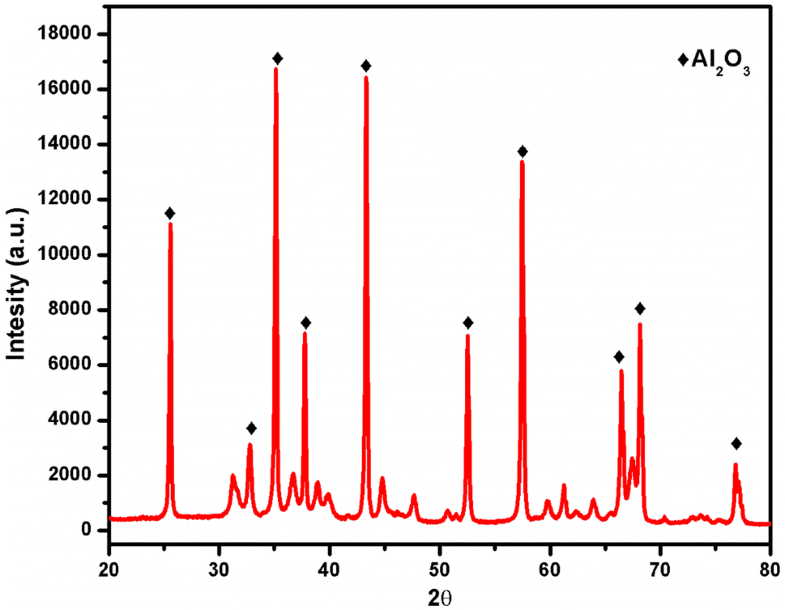 The properties of the alumina nanoparticle are tabulated in Table 1. Two-step method was used for preparing the nanofluid. The XRD images of the experimental peak with match data are shown in Fig. 2. 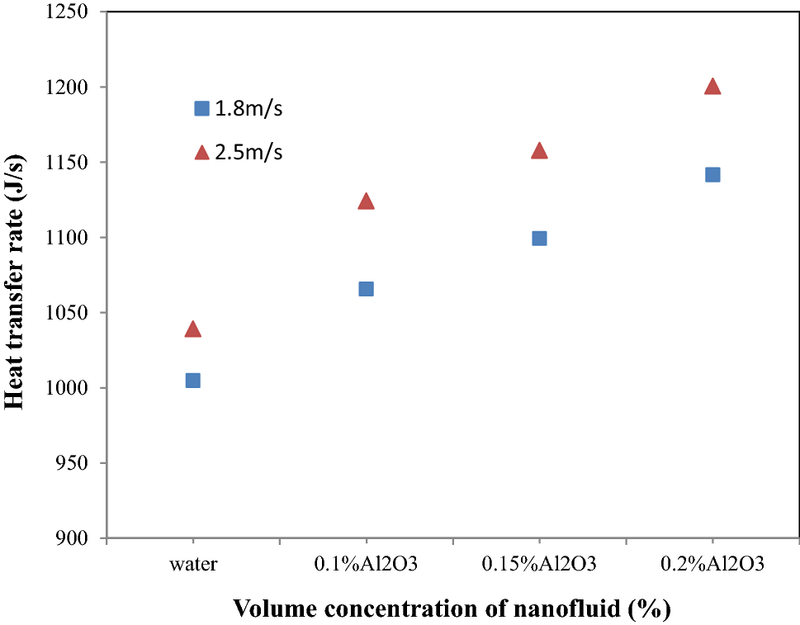 The performance using Al2O3–water-based nanofluid in comparison with distilled water is carried and presented. It was observed that the high flow rate in the radiator tubes and connecting pipes improve the stabilization of the nanofluid. The required amounts of nanoparticles for the required volume concentrations 0.1%, 0.15% and 0.2% are 39.7 g, 59.63 g and 79.55 g, respectively. The density and specific heat capacity of the nanofluid of different concentrations are computed based on a mathematical model (refer Eqs. 2 and 3) given by Pak et al. . The calculated results are presented in Table 2. The variation in heat transfer rate concerning nanofluid concentration is shown in Fig. 3. From the results, it can be concluded that the heat transfer rate increases with an increase in volume concentration and inlet temperature of the radiator of nanofluid for a given flow rate and velocity. The effectiveness of the radiator was calculated for distilled water and prepared nanofluid at a different range of flow rates of liquid through radiator at the variable inlet temperature of the fluid. The computed effectiveness for a fixed flow rate and fixed inlet velocity of air is shown in Fig. 4. The results indicates that the effectiveness initially increases with an increase in radiator inlet temperature; but beyond 65 °C, it starts decreasing for fixed flow rate and air velocity. It is also observed that the effectiveness increases with an increase in volume concentration of nanofluid. The maximum effectiveness can be achieved in the range of 60–65 °C of radiator inlet temperature for all volume concentrations. 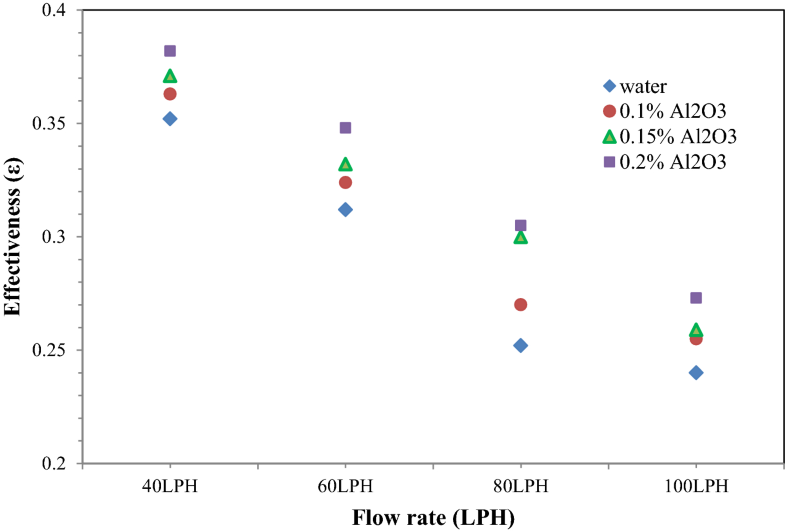 The change in heat transfer rate with volume flow rate for distilled water and nanofluid of different volume fractions is shown in Fig. 5. It can be seen from the figure that the heat transfer rate increases with the increase in volume flow rate for the fixed radiator inlet temperature and air flow velocity at the inlet. The effectiveness of the radiator for fixed inlet flow temperature and air flow velocity decreases with the increase in the flow rate of the nanofluid (refer to Fig. 6). Similarly, decreasing effectiveness is observed for all the concentrations with the increase in flow rate of nanofluid. An exhaust fan was used to circulate air on the radiator for cooling of hot water and nanofluid which circulate through radiator tubes. Heat transfer rate was calculated for distilled water and diverse volume fractions of alumina-based nanofluid for a fixed flow rate and fixed inlet temperature of the liquid. After experimentation, it is observed that for the fixed flow rate of the nanofluid and inlet temperature, the rate of heat transfer increases with the increase in inlet air flow velocity on the radiator by the forced air impinged by fan (refer Fig. 7). The heat transfer rate of the automobile radiator improves due to the presence of Al2O3 nanoparticle in water. The increase in inlet temperature of the nanofluid increases effectiveness, but beyond 65 °C it starts decreasing. By increasing the nanoparticle fraction in the base fluid, the rate of heat transfer increases. With the increase in the flow rate and at fixed inlet temperature, effectiveness of radiator decreases. As heat transfer rate can be improved by nanoparticle-based nanofluid, automobile radiators can be made more effective and compact. It also results in reducing the weight of the vehicle by making it more compact which results in better fuel efficiency. Although many researchers have completed a lot of work in this field, but still, the branch of nanoparticles and the mechanism behind it are yet to be explored.